Maj. Gen. Dawn Dunlop, Special Access Program Central Office director, Office of the Undersecretary of Defense for Acquisition and Sustainment, poses for a photo in front of an F-22 Raptor at Edwards Air Force Base, California Feb. 1, 2019. Dunlop was accompanied by more than 80 fellow female aviators to take part in filming of an Air Force Recruiting Service television commercial. The commercial was made to coincide with the release of the new film “Captain Marvel,” which also involved filming at Edwards. One of the Airmen showcased in the recruiting video was Maj. Gen. Dawn Dunlop. Dunlop currently serves as the Director of Special Programs in the Office of the Secretary of Defense. She is also the highest ranking female fighter pilot in the Air Force today. Earlier in her career, Dunlop served right here as the 412th Test Wing vice commander and eventually the wing commander, the first woman ever to command a Test Wing. Edwards AFB has been around for more than 85 years and the men and women here have enabled virtually every breakthrough in U.S. military aviation history from the first jet aircraft, to X-planes on the edge of space, to today’s F-35 development. 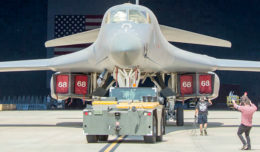 Dunlop said she thought it was just appropriate that the Edwards AFB flight line became the stage for so many women aviators, representing just how far the service has come since it first opened the doors for women pilots in 1980 and combat pilots in 1993. Dunlop graduated from the U.S. Air Force Test Pilot School at Edwards in 1998 where she graduated as the Top Graduate in her class. 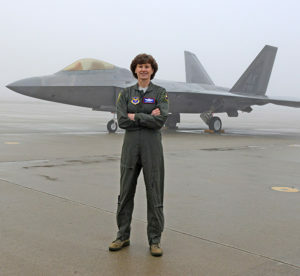 Dunlop then became the first woman to become a fighter test pilot and the first woman to fly the F-22. She said that the test pilot environment at Edwards during that time contributed to her success at Edwards and in the Air Force. From left: Brig. Gen. Kristin Goodwin, Commandant of Cadets of the U.S. Air Force Academy, Maj. Gen. Dawn Dunlop, Special Access Program Central Office director, Office of the Undersecretary of Defense for Acquisition and Sustainment, and Brig. Gen. Jeannie Leavitt, Air Force Recruiting Service commander, pose for a photo at Edwards Air Force Base, Calif., Feb. 1, 2019. The generals were accompanied by more than 80 fellow female Airmen to take part in filming of an Air Force Recruiting Service television commercial. The diversity seen in the Air Force’s recruitment video highlights the positive effects that diversity has had on the Air Force, effects that may not be easily seen. 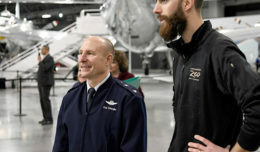 A more diverse force affords the Air Force and military in general to better recruit the most talented and innovative people possible, she said. “Today there is much data on the correlation between diversity and success in an organization and much has been written on the value of diversity in the workplace to include improved productivity and innovation, increased retention and broader success,” Dunlop said. “Being more inclusive, casting wider nets for the best talent, and measuring what matters are just as important for the military as they are for business. According to the Air Force Personnel Center’s current demographics information, women comprise about 20 percent of the total force, while only 6 percent of all pilots are women. 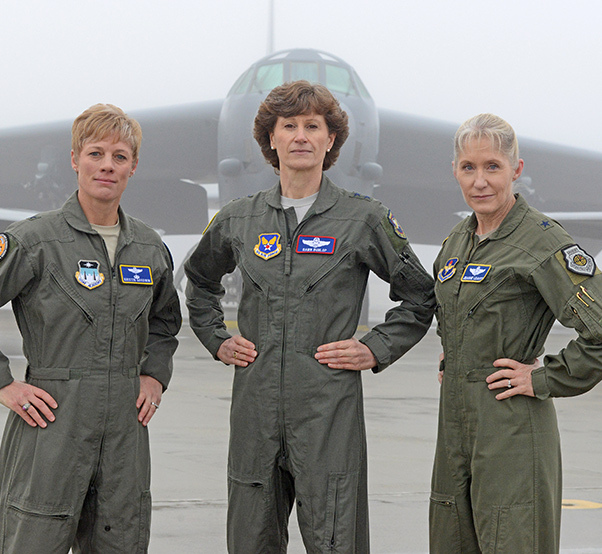 Dunlop says that while becoming a female aviator is still a relatively unique career choice, she hopes that young people understand that joining the Air Force is a viable opportunity for everyone. Dunlop also said that while being a woman aviator today is still a very unique career choice, today’s women seem to find more acceptance and support, which she expects will lead to increased opportunities and better retention. Maj. Gen. 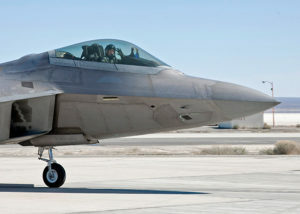 Dawn Dunlop, former 412th Test Wing commander, conducted her final flight as wing commander onboard an F-22 Raptor at Edwards Air Force Base, Calif., March 12, 2012. Dunlop served as the vice commander and then eventually commander from August 2009, to March 2012. While, some may consider Dunlop and her contemporaries as trailblazers, she contributes her success to friends and supervisors who helped shape her career outlook. Dunlop said that with this approach, in a career spanning 30 years, she’s found herself flying F-15 Strike Eagles on the deck in Europe; flying the F-22 at 60,000 feet and Mach 2; teaching lieutenants to fly in the T-38; working in the U.S. Senate and with the White House; and responsible for 6,000 people working to deliver 316 programs to help further strengthen the military.